I admit to having a sweet tooth and enjoying my desserts. And it just so happens that the kids also love sweet treats. However, we can’t be eating chocolate, ice cream and popsicles on a daily basis, you know, too much sugar, unhealthy and that sort of thing. So a while back when someone mentioned the idea of freezing yogurt, I decided to try it out. Not only were they easy and healthy, it was fun to make and tasted delicious! And so Frozen Yogurt Drops came to be! 1. Tear off a piece of foil and fold it in half. This makes it a little sturdier. With your teaspoon, take a dollop of yogurt and drip it on the foil. 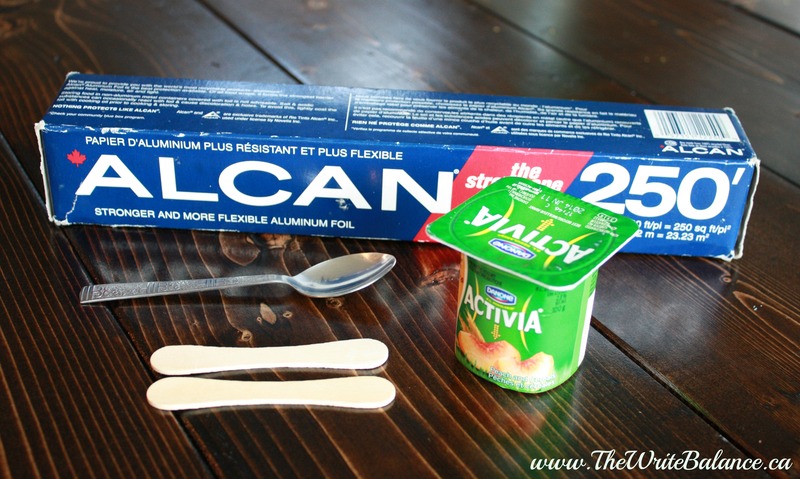 Then place one end of the popsicle stick on top of the yogurt. 2. 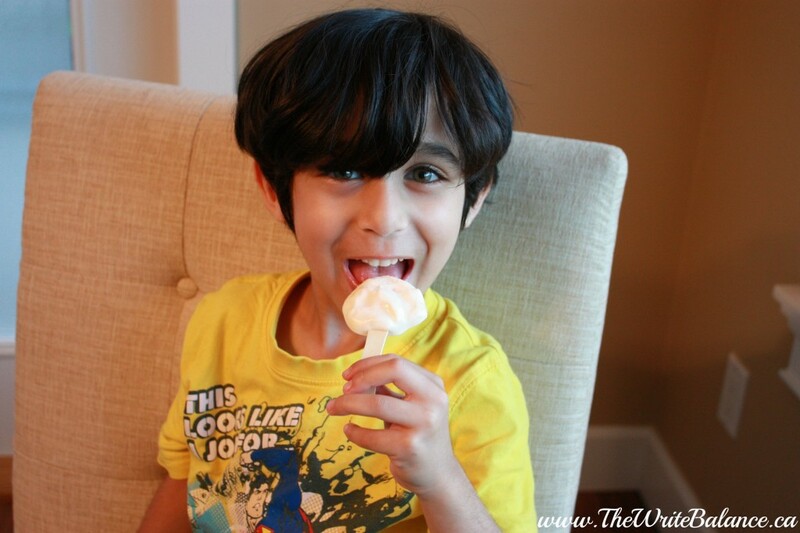 Put another dollop on top of the stick to complete your yogurt popsicle. 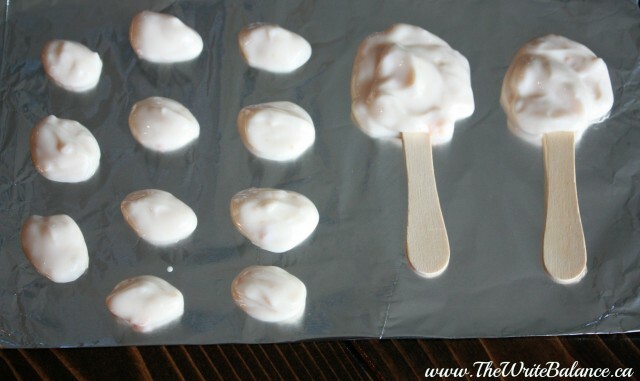 Make as many popsicles as you want down the foil. I usually make a big one for Keyan and a smaller one for Kyah. I also like to make a few frozen yogurt drops or buttons without the popsicle sticks.. The kids can help you out with this and t’s always more fun for them to eat something they’ve helped to make. 3. Place your piece of foil directly into the freezer. It only needs about 25-30 minutes to freeze. 4. Then voila, they are ready to eat. Simple, delicious and healthy. You and the kids won’t be able to stop eating them! On a warm day, these are perfect to make quickly before lunch and once lunch is finished, your sweet treats will be ready! I would recommend eating them all the frozen yogurt drops in one day, so they are not sitting uncovered in the freezer for a week. But trust me, they will disappear very quickly once you try them! I hope you like it Alexandria! great idea. Thank you for sharing! I love this idea. My daughter loves frozen treats, especially with the hot weather but I hate all the sugar. This is a great alternative. Yes, it’s a great healthy alternative for hot days when we want something nice and cold! I didn’t know you could do that with yogurt 🙂 Brilliant idea for summer treats. Might try it with my Weight Watchers summer fruit yogurt too to see if that works. I hope you like it Ana. They are great for everyone Hillary, a perfect sweet treat. What a lovely idea! I quite often put yoghurt’s in the freezer! Love this idea, Salma. Wondering if it will work with coconut yogurt as well. I’ll give it try and let you know. Always looking for healthy sweet snacks and this sounds perfect! Hi Beth, I actually tried it with coconut yogurt as well and they turned out great!! They wouldn’t last a week in my freezer – gone in one sitting!